Last week I had dinner with a friend who remembered that when he was a child, one of his teachers wrote the word OBSERVE in huge letters in their classroom. To enforce this imperative, she warned students that she would call on some of them every day to report on what they’d observed; they had to offer considered thoughts and observations. My friend — a sweet, shy man — laughed a little when he says this made him observe the world around him for fear of being caught without thoughts or observations, but it’s clear in retrospect he feels nothing but respect for that teacher who taught him the lesson of taking time to consider the world around him. I’m quite certain that as he recounted this story my mouth fell open, and I wondered in part how I might teach my (college-age) students something similar, but also wishing I were more thoughtful and observant. If our life is poured out in useless words, we will never hear anything because we will have said everything before we had anything to say. Silent Light is a film what takes its time, to paraphrase Mae West. Clocking in at 142 minutes, you have to rid yourself of that impatience for a breezy 90-minute flick — and I can assure you, it’s worth it (and it’s streaming on Netflix right now). Its opening shot simply holds the camera still while we watch the sun rise. Watching this perfectly ordinary yet magical explosion of light and color took me back to childhood, a time when I knew every single plant and tree within the bounds of the fence that surrounded our rural house. From there we watch Johann and his large family pray silently before breakfast. Or we follow his feet as they walk methodically through tall grass. Or we watch the children bathe themselves and each other in an outdoor cistern. Or we look out the windshield as the nearly silent Johann and his wife drive along a long, flat Chihuahuan highway as a storm starts to break into rain. It’s absolutely beautiful — and it’s meditative for us 24/7 multitaskers glued to our screens. It’ll encourage you to observe more closely the world around you. I can’t remember the last time I saw a film that used its pacing to evoke the rhythms of farm life so effectively. Silent Light used non-professional actors (Mennonites from Mexico, Germany, and Canada) and is conducted in the language of Plautdietsch, spoken by many Mennonites in communities throughout the world. 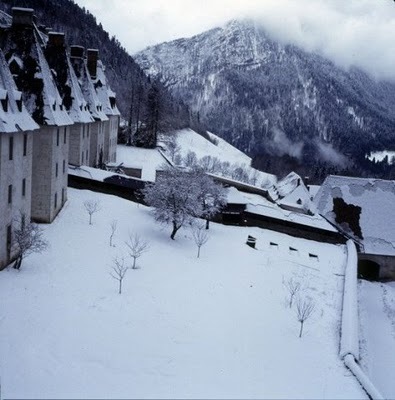 If there’s a similar film, it’s Philip Gröning’s Into Great Silence (Die Große Stille, 2005, and also streaming on Netflix), a documentary about the Carthusian monks at La Grande Chartreuse, surely the most beautiful monastery in the world. Using solely natural light and sound, Gröning captured all those small moments: watching the fog roll across the Alps, or an old monk clearing beds for planting winter vegetables, or a young monk being welcomed into the monastery, or feeding the cats or distributing lunches to the praying monks or washing the dishes without running water. I understand that some might find this film too quiet (and long: it beats out Silent Light at a whopping 162 minutes) but I can assure you it’s transfixing and one of the most affecting documentaries I’ve ever seen. My last recommendation looks like a thriller in contrast. 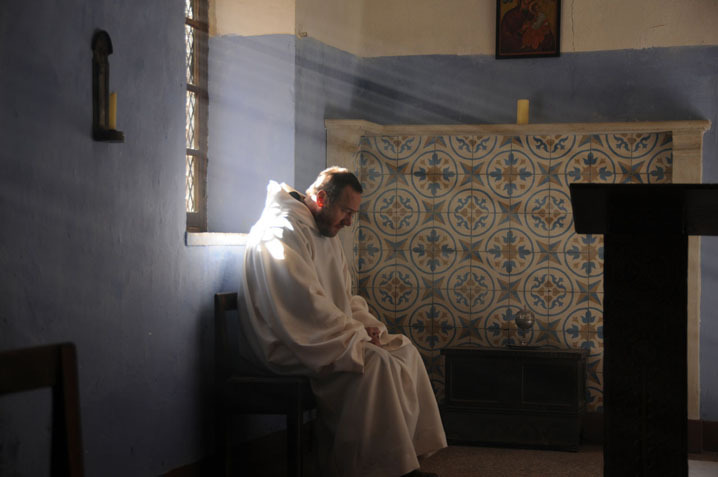 Of Gods and Men (Des hommes et des dieux, 2010), a narrative film by Xavier Beauvois based on the true story of the lives of French Trappist monks in Algeria in the 1990s. Despite living in relative peace with their Muslim neighbors — among other things, they offer free medical assistance to the villagers — the monks face an impossible dilemma when the nation slides into civil war. After an election produced results unfriendly to the Algerian government, leaders annulled those results and declared martial law, only to be faced with a growing Islamic insurgency that increasingly results in murders in their region. Should the monks save themselves and return to France, or should they remain? Is it right in God’s eyes that they should act to save their own skins? Do they even have families to return to in France? I’m being facetious, of course, when I say this film plays like a thriller (and that comment only makes sense in light of the two previous films I’ve discussed). What I should convey with more accuracy is my appreciation for the film’s intelligent and eloquent treatment of the multiple conflicts between faith, politics, social responsibility, and simple fear for one’s life. I was blown away by how it navigated those questions by showing each monk’s individual struggle. Whereas some believe from the outset that they should remain to, some like Christophe (Olivier Rabourdin), above, agonize about their decisions in the most visceral way — crying to God for help in the night. In so many ways these films treat individuals who seem to live out of time — compared with the monks, the plain Mennonites appear the most worldly — and one might be inclined to view them through the lens of a certain degree of romance. Instead, for me they’ve heightened my awareness and reminded me to slow down. Observe. Breathe.